Pipeline on a 3rd reef day." Hawaii 1999. My first Close Encounters with AS'ers. Isn't this the right place to start? SoCal 2000. John Hermesman, my son Alex, and I shared some waves and story at Trestles (July 1). John hasn't been surfing long but is full of surfing stoke. John has developed a clever surfboard rack for the bike ride down to Trestles at the cost of $10 or so. [see pic of the three of us] The next day, Sunday, I wanted to hook up with NeoN and the gang at San Onofre but there was a 2-hour line at the gate so I ditched that idea and went surfing at Trestles instead. GuidoPalooza 2000. Traveling surfers? Guess that means two or more surfers who traveled at least overnight to surf waves outside of their "local" turf. In this instance virtually all of my "tripster experiences" were shared with GuidoPaloozers from up and down the East Coast plus the Great Lakes. At the GuidoPalooza 2000 (GP2K - 9/2000), the AS tribe gathered at the Tory House in Buxton, NC, in the shadow of the famed Cape Hatteras Lighthouse. The group included Craig Kemnitz (Chicago); Edmund and buddy Jason (Ohio); KC and Svetlana Filer and Foon (Maryland); Mark Sisom and SurfSarge (and gf Trish) (New Jersey); Nancy Schultz (Wilmington, SC) and Flek (Myrtle Beach); Myron and Ste veM from the Tidewater area (Virginia); and Rico Bates and buddy Ralph (Cape Cod, Mass.). [see pic] (Sept 2000). SoCal June-July 2001. PontoPalooza, hosted by Joanne VanMeter and her husband Don, kicks off my visit to the San Diego area in fine form. The waves were of low form and size but I did share water time with Joanne, Dan "Crag" King (he was trying out a standup board! ), ripper of the evening TDsurf, and Ben Rak (just back from Cabo). Admiring our efforts from the shoreline were Bill Andrews, Terry Hendricks (sdbchguy), a recovering George Barnes and Mike Lietzow; and, various family and friends: Ray & Laura (Joanne's family); Dan King's friend (Dan is one lucky guy! ); George's wife and younger daughter; Ben Rak's friend Roy; and Joanne's surfin' chick friend, Leslie. A couple of days later I met up with George Barnes and Higgins for an extended tour of the Sunset Cliffs area--met a fellow paipo boarder, Stu. Dawn patrolled at 4:40am the following morning at Ocean Beach w/Barnes. In the afternoon, Keener showed me around the La Jolla area reef area and we ate at the El Pescador. The next morning, Keener, my son Alex, and I shared some small, but tight curls at Horseshoe while two of Alex's friends watched from the shoreline. In the afternoon I grabbled some swells at JJ's with Joanne VanMeter and later in the session with BA. JV delivered post-session intoxicants to warm me up until the hot tub session. A late start on Tuesday meant that Terry Hendricks, Alex and I missed a water time opportunity with John Hermesman and visiting Rincon waterman, Tim Maddux -- we crossed paths on the trail to Trestles. GP2K1 Prequel. The family and pooch set off for a one-week vacation to Cape Hatteras (early August 2001), staying in a local Avon Motel. Post such on AS... SteveM and Myron came down from the VaBeach area and were joined by Flek (Myrtle Beach) -- they camped at Frisco Woods for an extended week-end (Thu-Sun). A low-pressure system (and local winds during the week) created some nice surf on Thu/Fri, diminishing on Sat. A great time was had by all. Used some of my spare time to do some pre-GP2K1 research. GuidoPalooza 2001 promises to geographically extend south to Florida and west to Texas. 2001-08-18,19 - Ocean City/Assategue, MD - Weekend MicroPalooza@Foonbunker Shores. 2001-09-17 - Santa & His Elves in Orioleland. After being booted out of New Jersey by a raucous group of Guidos, Santa Keener did his best to speed down to Orioleland to meet up with some friendly elves [see pic here] as he continued on in his quest of the Four Points Tour of the USA. Santa was in dire need of help from these elves as his exotic carriage rolled into south Baltimore with a nearly flat rear tire. Santa feasted on some fine Maryland Crab Soup, a pair of Maryland Crab Cakes, and topped the meal off with some fried cheesecake ala mode. In between bites he entertained us with stories of his adventures, including some strange encounters in the nation's far northwestern reaches. He claimed again and again that folks out there really attempt to surf and be hospitable. Santa also mentioned some indescribable meals and folks in the northeast and some weird forms of entertainment practiced by the natives of New Jersey. The next day I helped poor Santa down the road to the not-so-local Honda shop for an exotic tire replacement. Here's trusting he safely made it to Cape Hatteras before the swell died (it *was* flat in Baltimore Harbor and the northern Chesapeake Bay). P.S. The biggest elf of them all, FoonElf, was unable to attend and KevinCElf was packing for a trip to SoCal...both sent their regrets (but Foon secretly told me that he didn't like the idea of Santa closing in on his Close Encounter points lead). GuidoPalooza 2001 (Oct 6-10, 2001). My report is posted on the GP2K1 page - click here. This year's GP trippers included KC Filer (MD), Sarge (NJ), Foon (MD), DeeDee (MA), Andy Woodard (AL), Todd (MA), John Ferguson (FL), Edmund (OH), Neal Carver (MD), Myron (VA), SteveM (VA) and Rod Rodgers (MD). Non-ASer guests included KC's wife, Svetlana, and Ferg's pup, Lucy. See the GP2K1 Trip Reports and Pics and a pic of (most of) the group in the Tranquility Base GP station. GuidoPalooza 2002 (Sept 2002). A great time was had by all. New trippers included Kirk Mantay and Dan King. See the GP stories at the GP2K2 Stories and Pics page. NW Puerto Rico (February 2003). Joanne VanMeter, Dan King and I blasted the NW coastal Puerto Rico breaks... the one breaking anyway. See JCV's storylines in her videos and pics. My reports are posted here. Costa Rica (April 2003). 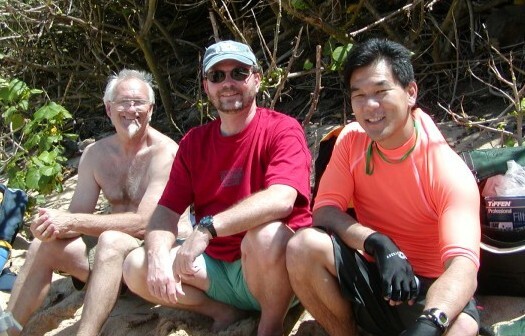 ASers Neal Carver, Kirk Mantay and I took a week off and tripped down to the Tamarindo area. Waves ranged from waist to well overhead. We surfed plenty of good reefs with just ourselves or a few others out in the water. Report and some pics are posted here. San Diego/Deep Baja (June & July 2003). Work and fun plunked me in San Diego three times between June 15th and July 9th. Tom Keener and I dined all over town during these three visits; George Barnes hosted an excellent slide show on a mysto South Pacific island and the Galapagos trip (George and Carson) that was attended by several ASers: Carson, TD, sdbchguy. My wife and I dined with the Hermesmens and Kings on one occassion and the Duncans on another. Scored surf with BA, JCV and TD. Capped the last visit off by tripping down to Deep Baja with Dan and Terry Hendricks (here are some pics from the trip). My larger report posted to AS is here. GuidoPalooza 2003. The probabilities of tropical storm surf fell right into place this year as we played with remnants of Henri and the initial assault of Isabel before the mandatory evacuation on the 4th day. A good mix of ASers and Annapolis Surf Club members, many of which are double dippers, including KC, Foon, Neal. First encounter with DaGriz--he had just scaled the dune at Boilers as I was standing there with my board, called over to me, "Are you the guido known as Rodino?" Yahoo! I replied to DaGrizalino :) Let's go surfing. We caught some nice 6-8' with occassional larger sets. More at the GP2K3 page. Also GP'ing were Myron, Edmund, Craig and almost, SteveM. Salsa Grill - Jan. 2004. Spent the evening with Catherine Elkins, Ken Strayhorn and friends. Cat, my wife and I had gotten together a couple of times during the Fall, but had missed calls or been out of town between our work schedules and Cat's new house purchase. We knocked back several beers, munched on cheese and crackers, and drifted into the esoteic world of academia and gov't over the next several hours. These folks are genuine Southerners! The Salsa Grill was the perfect venue for kicking back and polishing off another couple six-packs of stouts and ales and chewing the fat. Good to finally meet Ken! 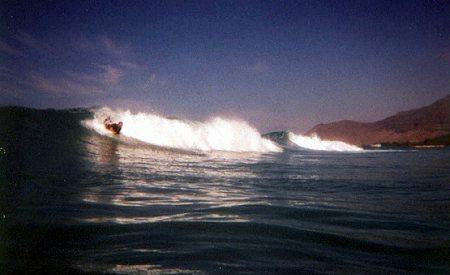 Warm Water Feels Soooo Good (after cold 39F DelMarVa and chilled 49F N. Oregon) - March 2004. A co-worker and I headed up to Sunset where an alt.surfing friend and celebrity, Neal "Sponge" Miyake, was competing in and helping to direct an "Old Styling" surf contest. By chance I (and Neal) also made a new acquaintance with an alt.surfer there - Jim the Genius Phillips - we chatted for about an hour. Well... Jim mostly chatted, full of stories to tell about the good ol' life back East (including the DelMarVa) and boards/fins he makes for a living working up at the Encinitas shops on Lake Avenue. Neal was busy competing and running the show so we had very little time together. Missed Bud as well. We chatted on the cell -- he was up at Rocky Point. Next time good man! My buddy took a photo of us as proof of the alt.surfing encounter (see here). My full trip story to HI here. GuidoPalooza 2004 (Sept 11-16, 2004). This year's GP trippers included Craig Kemnitz, Edmund, Foon, KC Filer, Kirk Mantay, Myroni, Neal Carver, Rick Miale and SteveM. See the GP2K4 Trip Reports and Pics . N. Oregon -- November 2004.Neal Carver and I rented a house for the week in Manzanita that we all shared off and on with Paipo Jim and Andy, another paipo rider and their two sons, both who rider the paipo and/or shortboards, in addition to Rod's HS schoolmate and surfing buddy, Leon (from S. Washington). Sponge Visits the Capital (May 2006). There was a Sponge sighting in the District of Columbia region... can't say when since the Sponge travels under the shadow of darkness these days. Foon comments, "yep, pretty covert how he diverted your attention with stories of dodging waterphotogs then snatched the check. He's a very cool dude for a middleage wannabee. Good to see ya spongie, but you need a better disguise. I'd recognize you anywhere." Thanks for dinner! George of the Jungle Visits the Capital (July 2006). George was in town during the week for some business and *insisted* upon increasing our Close Encounters points totals ;) Foon, he and I story talked, drank and dined in a downtown establishment not too far from my working digs. George lived the better part of the past decade or so in the Hawaii, but relocated to inland North Carolina about one year ago. He has been studying up on the ways of forecasting East Coast surf, prognosticating upcoming tropical storms and figuring out how to best prepare for this year's GuidoPalooza. I suspect this was really an intelligence gathering trip ;) Many thanks for the fresh roasted coffee beans... been enjoying some excellent coffee all weekend! GuidoPalooza(s). George has been to the last several gatherings in Cape Hatteras, formerly known as GuidoPalooza, and now coined the Guapo Paipo Pride Palooza 20xx (GP32Kxx). He even attempted to master The Preciouuuuuuuuuus. A Close Encounter of the alt.surfing Kind - Doc Visits the Baltimore-Washington Mecca of Hot Surfing (April 2010). The stories as told on A.S., and this is a long one in the honor of A.S.
Rod writes, "The A.S. Doc flew the coop, showing up in Charm City, hungry, dehydrated and confused. Rod and Foon to the rescue! We quickly sported him off to a local restaurant for a fill of crab cakes and international suds, and recovery was set into motion. Back to Casa de Rodgers for some story talking aided and facilitated via a tour of Caribbean rums. Alas, we did not complete the tour during this visit... guess the grand descent of AS going to the 4th Stall on the Left continues :) In the early evening we drove down into the ghetto of Baltimore for some Attman's kosher sandwiches, but they closed down at 6:30pm. Bummer. So, we headed off to an old Balteeemore watering hole and restaurant, Café Hon, for some more jibber jabber. He is now in the care of Nurse Foon. Doc: Not going in order of publication, just so I can avoid the m@rk memorial award for answering one's own posts. The confused is a general state of mind anyhow. In many ways a comfort. Hungry and dehydrated were dealt with immediately. A good time was had by all, and I will most definitely be back, with more space in my itinerary next time I get to play John Beresford Tipton. As this IS alt.surfing, first ....it's about the food. If you're in the Baltimore area, you get amazingly good crab cakes in places that by rights should have only CentroAmerican/ South American food. On the other hand, hotel crabcakes ain't up to snuff. On the other other hand, hate to say it, but we do better oysters up here, especially the ones (Nauset Marsh Selects) I grow. Life ain't fair, have to bring a cooler next time too. Yuengling ( sic) is available about everywhere, and that's the good stuff from Pennsyltucky, not the stuff from the new brewery down south. Crafty-type beers ain't everywhere, alas. Nor was Pacifico, which another of our denizens introduced me to recently. Rodrigo knows his rums, he do. Alas, lack of sleep previous forbade the true appreciation of all of 'em. But then again, they won't stop making 'em. As JB might recall, the Flors de Cana 7 year old amber is a delight, prime stuff. And the Beltway Boys are good and generous hosts. Interesting, freewheeling and wide-ranging conversation, from power tools to AS denizens present and past. Never fear, most of you came off well. Those who didn't.....you had it coming. As this was also a kind of AS Alternative Forms palooza, technical stuff got precedence and Spicoli-like appelations were not to be heard. And on that note, I am back to the grind tomorrow at 5 AM, so I deeply need some sleep. Keep well, AS, we ain't dead yet. Foon comments: Not much caretaking necessary for doc. He travels light and requires very little. Truly a low maintenance guest. Not like Rod who wants everything his way from the rum to the correct kind of designer craft brew beers to the matching hand and bath towels in the powder room to the triple ply scented pillow soft bathroom tissue. It had been a long day for Doc, up when the bat signal was spotted and staggering through connecting flights in Boston at O Dark 30. Maryland did not favor him with its best weather (cold and rainy) but that did afford us the opportunity to let Doc sit a spell at Casa Rodgers for a rum taste palooza. I'll give Rod this, he does have the good stuff but since I was the designated driver I was insisting on only half shots of his splendid collection. There was just one though that bit my tongue like a rattlesnake and hit my stomach like a jigger of moonshine on steroids. My mouth tingled for quite awhile over that 'un. I gave Doc the nocturnal quick and dirty tour of the Washington Beltway (he was curious about the Mormon Temple in Wheaton) then packed him off to sleep in the Foon family guest quarters. I set up a rudimentary blend of coffee in the brewer and told him to have at it if he got up before me. Which he did and I never heard him at all though the Foon Palace has very close quarters and thin walls. This was my second encounter with Doc and as in the first he is a delight to spend time with. His easy conversational attitude is all that more enhanced by an encyclopedic knowledge of lots of stuff across a wide range of subjects. And what he does not know about he had highly informed and astute opinions on most. Especially, members of the ancient and ithering cult called alt.surfing. I'd post a pic but would ask his permission first. Rincon, PR, so he's no ordinary politico. The AS GuidoPalooza Page, an annual alt.surfing Fall 'Palooza in the North Carolina's Outer Banks, hosted by the East Coast AS crew (webmaster). I also webmaster the comlementary Yahoo eGroups page and a couple of others.